RFQ (Request For Quote) Submission Flow Workflow is a system workflow that defines the sequence of steps and transitions that an RFQ can go through in the storefront and the management console. Click RFQ Submission Flow to open the flow. On the RFQ Submission Flow page, you can disable the workflow by clicking Deactivate the workflow. Internal Statuses (correspond to RFQ Management Flow) are described in RFQ Management Flow workflow. Neither customer nor internal statuses can be edited or deleted. 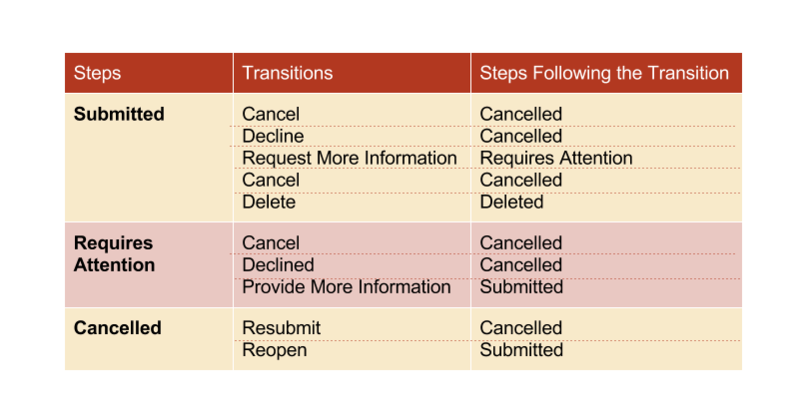 The following table describes which options are available for each of the statuses, and how the corresponding transitions change them. 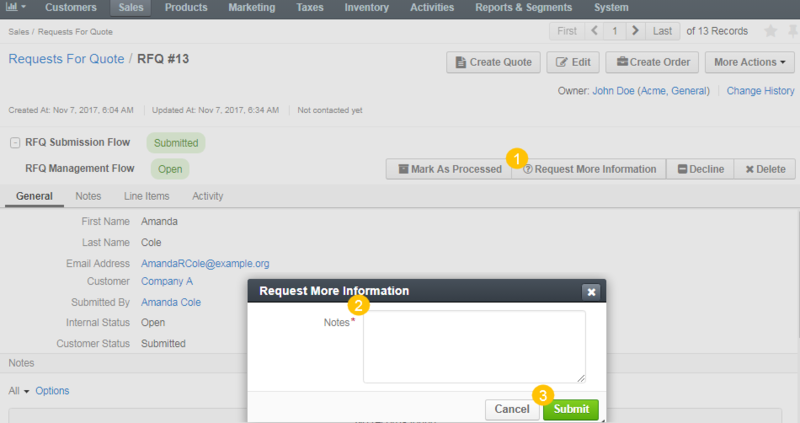 You can add and remove columns in the workflows list by clicking on the far right of the list. Please note that the Request For Information, Reopen and Decline transitions are visible only in the management console for the sales personnel. A customer user creates an RFQ in the storefront. 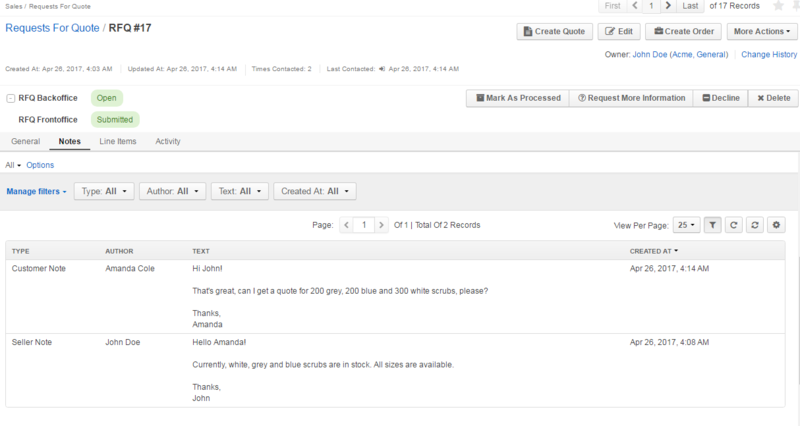 Once the RFQ is sent, its customer status is marked as Submitted. 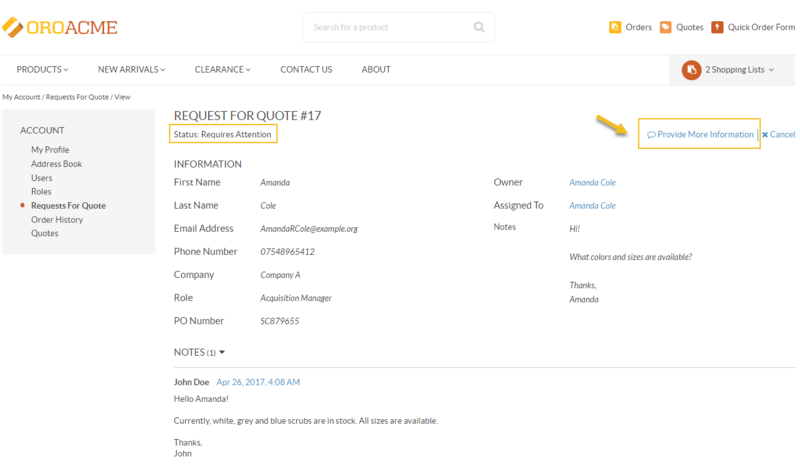 In the management console, a sales representative sees the RFQ and requests more information. The RFQ is now in the Requires Attention customer status. The customer user receives the request in the storefront, clicks Provide Information in the right corner of the page and replies to the message. The customer status is now Submitted. The sales representative reads the reply in the Notes section of the RFQ page, marks the RFQ processed and creates a quote from the same page. The RFQ is now in the Processed customer status.